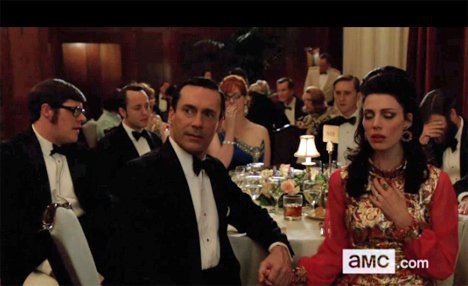 A time of tragedy and catastrophe strikes the nation and the world in the latest episode of Mad Men. Echoing the feelings evoked by present day headlines these past weeks, we see how everyone reacts to the assassination of Dr. Martin Luther King, Jr. in “The Flood”. The serious tone of the crisis seeps through everyone’s dialogue in this chapter as some choose to carry on, whereas others are deeply affected and influenced by the shocking news. We open on to a realtor showing Peggy (Elisabeth Moss) an Upper East Side apartment. Boyfriend Abe Drexler (Charlie Hofheimer) shows up late and confuses the realtor. Abe’s not the buyer, but we see another empowering gender role reversal as Abe is reduced to apartment consultant. Actor Paul Newman speaks at the awards for The Advertising Club of New York, where both Megan (Jessica Paré) and Peggy are up for nominations. The usual pleasantries and Roger Sterling (John Slattery) client appeasing happens over drinks as the ceremony starts with Newman endorsing Eugene McCarthy for President. His speech is interrupted by someone calling out to Mr. Newman the news that Martin Luther King is dead. They all take a break from the celebration and we see the look of surprise and disgust from the tables. In Brooklyn we cut to a virgin Michael Ginsberg (Ben Feldman) on a set up date with his dad’s friend’s daughter. In the diner, the radio broadcasts the news and black dishwashers take time to sit speechless. Over at the Betty Draper (January Jones) household, Henry Francis (Christopher Stanley) leaves to attend to city business, a calling of his profession as the Director of Public Relations. Fearing riots, he vocalizes his worries and scares the kids Bobby (Mason Vale Cotton) and Sally (Kiernan Shipka). Betty refuses to watch the TV, scared of the things they may show. At bedtime, Bobby exhibits some at the time was probably misdiagnosed bad behavior by peeling the wallpaper off of his wall because they patterns did not align. Seems more like an OCD symptom than anything else. Pete’s (Vincent Kartheiser) returned to his Siberian exile in his Manhattan apartment, calling Trudy (Alison Brie) to check in on his family. Trudy appreciates the call but stands her ground by not letting the womanizing husband back to the homestead. In a time of crisis, Pete is looking for the support of home, but the consequences of his actions are that he needs to stay away, with only Chinese takeout as his only friend. At Don Draper’s place, Megan argues with her Marxist father over the phone, as Don stares deeply into a bottle of Canadian Club whiskey as he watches the news of race riots on national news coverage. Megan won the award that night for her Heinz Beans campaign. In light of the news, no one really gives a bean, including Megan, who left the award on the couch with her jacket. An awkward day after happens at SCDP as well as at Cutler Gleason and Chaough, both firms have black employees. Peggy is slightly better at consoling her secretary than Joan is of trying to give Don’s Dawn (Teyonah Parris) an unwanted hug. Bert Cooper (Robert Morse) breaks up a yelling match between the hurt Pete and Harry (Rich Sommer). Harry is concerned about the loss in advertising sales because of the tragedy, and Pete calls him a racist. Bert cannot seem to diffuse the tension. Down in Draper’s office a meeting with a new client has everyone confused. An insurance man claims he was visited by Dr. King’s spirit last night and has a bizarre idea for a campaign that involves a molotov cocktail. Don’s not impressed, but hey, his own work hasn’t been much better lately! Home early from work, Don is back at the TV with the brown stuff. He’s forgotten to pick up the kids from Betty’s, and his relationship with his kids is suffering. Megan takes Sally to an MLK vigil in the park, and Bobby feigns illness to stay home with Dad. The two boys play hooky and check out a matinee of Planet of the Apes. In between the first and second showing, Bobby has a moment with the black usher that’s the highlight of the episode. He asks the usher if he has seen the Ape movie, and recommends it to the gentleman. “Everyone likes to go to the movies when they are sad”. This from the mouths of babes moment is evokes emotion in Don, something we see little of. At the end of the episode we have Harry announcing his bid for state Senator and taking more of a leadership role in his career. In all a dramatic episode, with diamond facets of how different people deal with tragedy and loss. As truth is stranger than fiction, the timing of this episode being released so near to a time of a tragedy in the Boston really hits home. Another way for us to lose our selves in a television show about the past here, as we switch to national news coverage ourselves and keep our loved ones close by. On the next Mad Men, we are teased with Peggy being annoyed by someone’s presence, more steamy silver fox bedroom scenes with Roger, and Peggy’s boss Ted Chaough possibly up to no good. These teasers are harder to gauge or extrapolate as we get later into the season. Lots of Don opening his office door and Roger on a payphone. We hope to see more Joan next episode, of course, with her hair down.